Beicip-Franlab and IFP Energies Nouvelles have been pioneering the development and the use of dynamic stratigraphic modeling techniques in both exploration and in reservoir characterization since the early 2000s. DionisosFlow is the world’s only commercially available solution for dynamic stratigraphic modeling. It is a powerful solution that allows modeling the development of stratigraphic sequences at regional scale or at field scale. The model solves the equation of sediment transport as a function of basin topography, sea level variations, and accommodation space. It ensures calibration against existing well data and seismic data. The result is a more robust and internally consistent prediction of 3D stratigraphic sequences as well as a prediction of facies distribution laterally and vertically. DionisosFlow is available as a commercial software solution. Beicip-Franlab provides a large variety of Consulting services that use the DionisosFlow approach to make better decisions in Exploration and in Reservoir Development. Generate lithofacies maps to be used as input to reconstruct more precisely oil and gas migration pathways and accumulations. Beicip-Franlab consultants have a large experience in using DionisosFlow in deep offshore exploration. In such context, DionisosFlow allows mapping and delineating turbidite fan, giving the net-to-gross of the different components (sand, shale, calcarenite) for each stratigraphic sequence. DionisosFlow complements seismic and geologic interpretation. It helps to reduce exploration risk in slope to basinal environments. Our exploration teams have a very good track record of successful applications of DionisosFlow to understand the development of stratigraphic traps. DionisosFlow provides a fine lithological description of the reservoir/seal. Our basin analysis team have shown how DionisosFlow, with its specific organic matter module, can be successfully used to predict Type II and Type III source rock quality variations at basinal scale, for both conventional and unconventional prospection. Source rock quality is derived from bathymetry, restricted area (anoxic environment), energy, sedimentation rate, organic productivity and sea level variation. 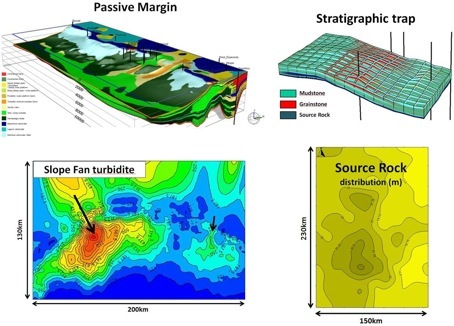 Our exploration teams have developed workflows linking 3D DionisosFlow blocks with basin modeling application such as TemisFlow (3D petroleum system analysis). Higher vertical resolution and more predictive distribution of source rocks, reservoirs and seals improve significantly basin modeling predictions. The link is also allowing evaluating more rigorously stratigraphic trap effectiveness. Beicip-Franlab experience includes passive margins context (Nova Scotia, Brazil, West Africa), carbonate ramp platforms (Middle East), deltaic systems (Far East Asia) and turbiditic/diapiric systems (Gulf of Mexico). DionisosFlow is the IFP Group industrial solution for stratigraphic modeling. It is based on rigorous science, it is easy to use, and comes along with a large set of proposed parameters that reflect the vast experience gained in actual applications worldwide. The tool is continuously upgraded and benefits from the development carried out by IFP Energies Nouvelles and its partners associate in dedicated JIP. High resolution sequence stratigraphy is a key discipline to understand field-scale lateral and vertical reservoir property variations and their implications on fluid production. Beicip-Franlab geoscience teams have developed original applications of DionisosFlow at field scale which allow capturing lateral / vertical facies changes in a way consistent with stratigraphic architecture. Out experiences includes the modeling of carbonates field heterogeneities (Middle East).